In a long a line of new games for the Android mobile platform, Drag Racing has found a key spot in the most downloaded free games in the Android Market. Its popularity has been steadily rising and this can be considered surprising as the game does not display stunning 3D graphics or showcase accelerometer controls. Instead the game is designed around a simple concept: Push the gas pedal and shift gears at strategic moments to make your way to the top. The setup of this game might seem slightly restricted at first, especially considering flashy 3D racing games like Need for Speed Shift already exist in the market for Android. However, Drag Racing has the addiction factor counting in its favor, something I can personally vouch for. Continue reading our full-fledged mobile game review if you want to know why. 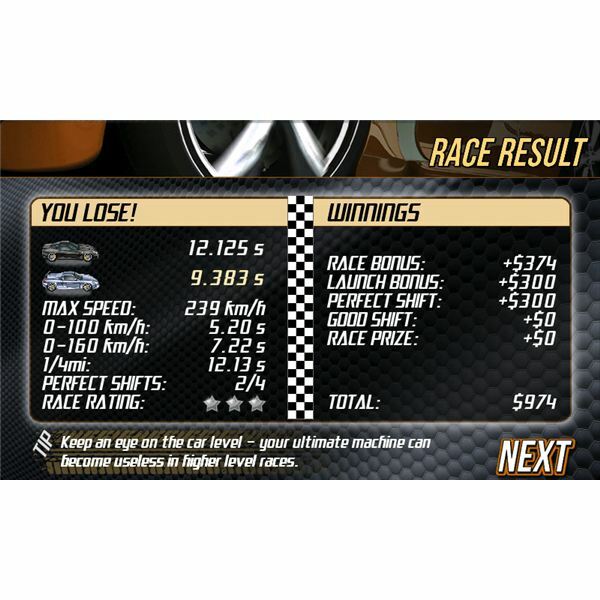 The overall principle of Drag Racing is quite conventional in racing games. You start with a low budget with which you can purchase your first car. This first car is obviously not the best but it will get you going in your first race. The game is set up in levels with each of these levels consisting of various races. You can race against a beginner, amateur and a pro, which will get you paid each time you win a race. You can win extra money by doing certain race tasks, such as shifting excellently or setting speed records. 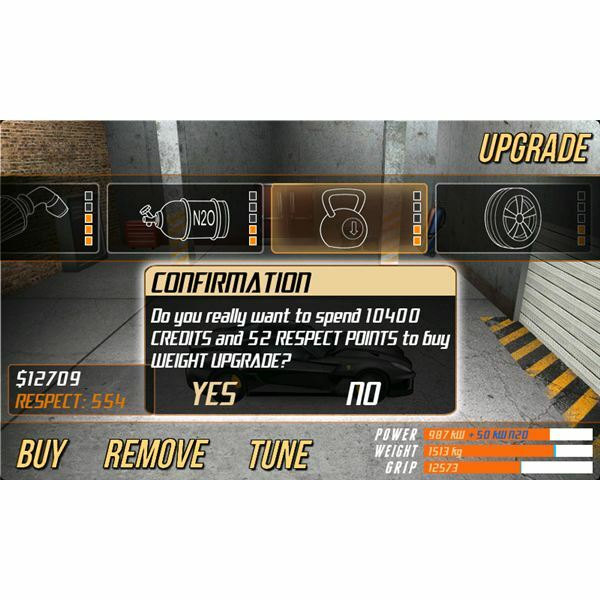 You can upgrade your car by spending the money you win. Besides hard cash you have to earn respect points as well, which are a lot harder to come by. Respect points are usually won by reaching certain achievements. This will mainly work fast in the beginning of the game, but as you reach higher stages the possibility of gaining achievements is a lot slimmer. Therefore the game has extra modes that will help you achieve fame and fortune, namely boss battles and online racing. Boss battles are available in the various levels as well, although beating a boss is not the precondition to progress in levels. Bosses can be challenged in both of the two drag racing distances, namely a quarter and half a mile in length. The precondition for progressing in levels is the strength of the car. Upgrading the car too much could mean it progresses to a level where, instead of dominating the field, it becomes the weakest link. The fact that your car needs cash and respect points to progress is a solid foundation for the game. However, in the case of Drag Racing this is also exactly what harms the longevity in general. As I mentioned, respect points are basically given in the beginning of the game, where you do not need them as much as later on. The solution is to play games online, which always pay out respect points, and more cash for that matter. 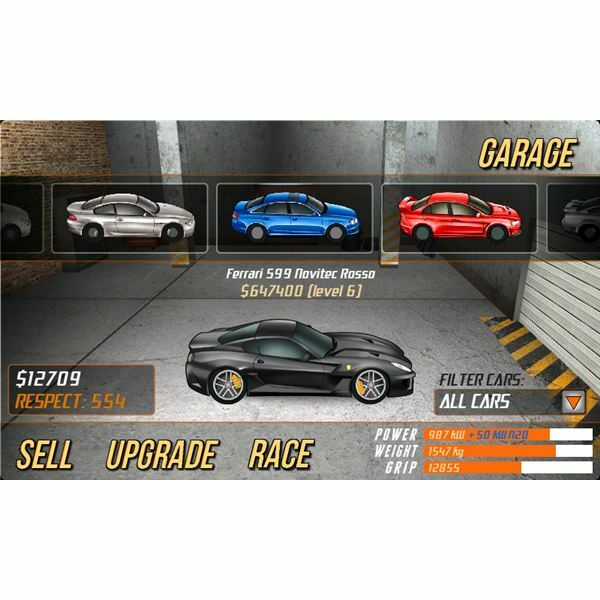 The offline modes will not help you make enough of either anymore so that you cannot upgrade your car, which in turn will kill your competitiveness and so on. It is a little odd that the online mode becomes a precondition to progress offline. Besides, even with online play, eventually it becomes too tedious to upgrade which effectively makes the game lose its addiction element. The remedy would naturally be to improve the achievement rates in the offline modes. In terms of graphics, the Drag Racing game for Android is not outstanding but it is also definitely not too bad. The graphics serve their function but you cannot deny the feeling that the resolution could use some up scaling. The good part is that these types of graphics make the game quite ‘light-weight’ with less data to process when you are, for instance, competing online. Cartoon style graphics always do relatively well on smartphones as people are more likely to be forgiving than with real gaming systems. In terms of game controls, there is not too much to report. Your car will accelerate by itself and it is up to you to strategically shift in order to beat your opponent. The only ‘unique’ aspect of your phone that is used here is therefore your touchscreen, which is, compared to other games in the market, a bit underwhelming. Your game results will be displayed afterwards with how well you shifted, how quickly you reached the 100 mile-per-hour mark and how much cash and respect points you earned. Drag Racing turned out to be a fun game that is obviously intended for the pick-up-and-play type of casual mobile gamer. The addiction element has been built-in through the upgrading options, which makes the game more than worthwhile. However, at some points, especially when it comes to earning money and respect, I cannot help but feel like that the game is not balanced enough and a bit too beta. The developer seems to acknowledge this and already made adjustments through upgrades. With a few more of these updates Drag Racing for Android could really become the excellent game its Android Market ranking suggests. Note. Want some tips to become a star in Drag Racing? Read our second part in this series for some handy tips and tricks! Drag Racing for Android is a challenging new game where car upgrading and strategy go hand-in-hand. Find out all about the game in our two-part series that both reviews the game as well as suggest the best tips and tricks for quick progress.